Rise of the Demons is the first expansion to the smash hit, one of a kind, totally innovative and highly regarded Quarriors™ Dice Building Game™. This expansion contains 20 all new Custom Dice and 19 new Power Cards, adding a new (icky) layer of strategy and fun to your favorite game of hexahedron monster combat. Rise of the Demons "brings the corruption" with three new Corrupted dice types, as well as a new "Corrupted" version for each of the 10 classic Quarriors Creatures. 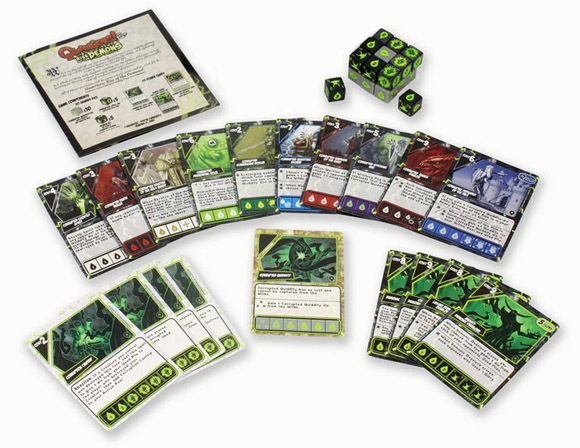 Flood your opponents with Corrupted Quiddity dice, or embrace the power of the mighty Demonic Overlord and blaze a glorious path to victory! In my review for Quarriors! the initial game, you could see that I really like this game a lot. The mechanics of the game are fantastic, the art on the cards are superb and the feel of the game is just so fun in my opinion. When I bought the game, I’d also bought the expansion pack, Rise of the Demons, and while my wife and I didn’t use the expansion for the first few games we played so that we could get the feel for the game, last night we added it to our game. First off, I’ll go into what you are buying. The expansion pack comes in a rather small box that contains one plastic tray with cards, dice and a small rule book that talks about how to incorporate the new cards/dice and so forth. This expansion adds 1 new creature, 1 new spell and a new form of dice Quiddity (money) to the game. Furthermore, the game introduces a new class of the existing creatures to the game as well, the Corrupted class. The dice are a bit easier to look at than the base set, in my opinion, and the cards and art work are on par with the first set – meaning they are pretty good on the whole. Rule wise, the game introduces a few different new rules and conditions. The new Quiddity (Corrupted Quiddity) could end up rolling 0, so its fun to find ways to put the dice into your opponents bag to mess them up a bit. You can also make players lose Glory Points too, something that I think is a fantastic addition to the game itself. The problems I have with this expansion are that its a bit difficult to add to the base game. The rules don’t explicitly call for the corrupted quiddity to start with players, so unless you want to add a house rule to it, then its possible that they just sit there and do nothing (kind of like what happened with the games we’d played last night). The games we played only had 1 of the new corrupted creatures in it, which didn’t have any real effect that was new to the game itself, and so the expansion felt like it really was just a part of the base game – with just a bunch of new dice sitting on the table that can’t be touched. While I like the abilities of the new creatures, I think it’d have been easier and less confusing to a degree, to have had NEW creatures in it instead of just Corrupted versions of the existing ones. Is Rise of the Demons a bad expansion? No, not really. I just feel that the expansion was a bit weak and a little half-hearted when you consider the game as a whole. Its perfectly fine and with a few house rules tossed in the game could even be really enhanced by the expansion itself, but its out of the box rules are a bit lackluster. However, with that said, I’ve seen some previews for the next expansion to the game, Quarrmageddon (I may have completely killed that spell by the way) in which the game fixes a lot of the problems I have had with this expansion, by adding new creatures and spells, so I feel that while this expansion may have been a little bit (and I mean a little bit) of a miss, the game will still be really healthy by the time the new set comes out. – a “hot potato” Corrupted Quiddity dice that no one wants to have (along with its one card). It also contains ten new cards that add new “corrupted” versions to the already existing creature sets. Mechanics-wise it also has a few new features including: a possibility to cull dice to the opponents’ dice pools instead of usual culling to the wilds, losing glory points, and permanently removing dice from the game. It also includes damage prevention, a feature that was already present in the Quaxos promo expansion. I think that no Quarriors fan should be disappointed by this expansion. It really expands the base game and it does not change it. The amount of player-player interactions is slightly larger, and the gameplay lasts a bit longer (yet not much longer which is important). The fun factor of the base game is fully preserved. A number of new combos and anti-combos between various creatures and spells appear. The new versions of old monsters are playable and innovative. Myself I will not play without Rise of the Demons any more. It is noteworthy that there is no corrupted version of the Demonic Overlord in the game! There is a “Lesser” version of this monster instead. It may well be a hint for an upcoming and not yet named second expansion to Quarriors. That new expansion is in fact mentioned in the Rise of the Demons rulebook… I’m looking forward to seeing it. I hope it will be as good as Rise of the Demons is. 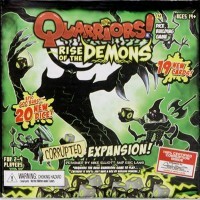 Rise of the deamons was the first expansion for Quarriors and it was OK. I do not think it added much to the game with only twenty new dice and nineteen cards. Of the new dice sixteen where the corruption dice and in my opion do not always end up in the game enough but did add a little chaos to the game. The new dice do not fit into the metal box well. The second expansion Quarmaeddon is much better. First off, I love all the dice… that being said, the game play is very fun and easy to learn. Replay value does diminish after many games as choices often become familiar. I recommend using the variant rule allowing the selection of two dice from the wilds every turn. Add a Review for "Quarriors! Rise of the Demons"